Factoring, as used in elementary school, is the act of changing a number into numbers that multiply to produce the original number. For example, 12 can be factored to 3×4. 3 and 4 are called factors of 12. In the photo above, a “factor tree” is used to help identify the factors. I have often seen the factor tree used as the initial approach to teaching factors. 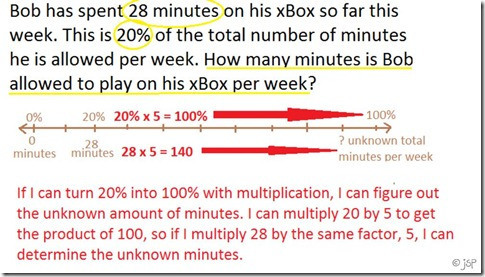 I’ve also seen it used as the primary means of providing intervention for students struggling with factoring. Think about that. 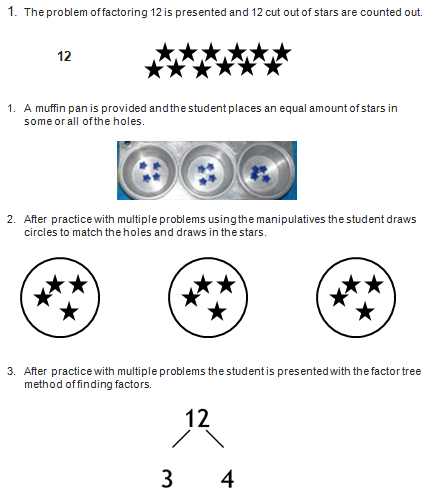 Students who didn’t understand the initial instruction that likely involved the mathy approach shown above were provided the SAME approach. 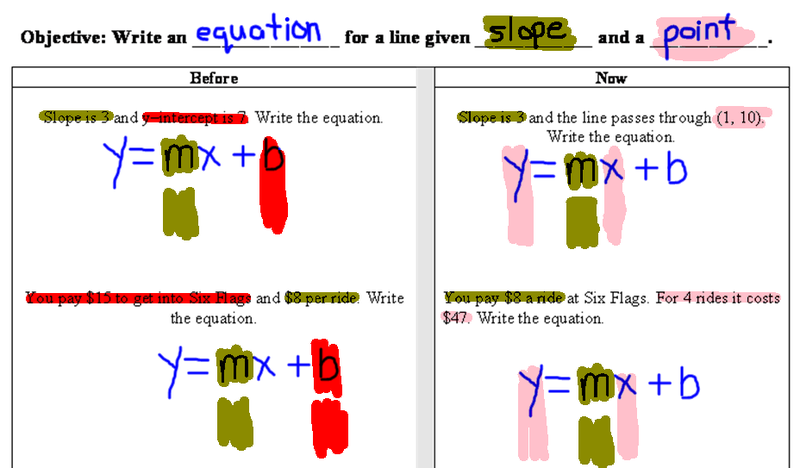 Math topics can be presented with a more concrete introduction which can allow for more in-depth understanding. The photo below shows a CRA approach to factoring. This approach can be used as part of UDL or as an instructional strategy for intervention. At my school we are looking to develop a track for math for students with disability for whom the traditional math courses are inappropriate. Many of the topics and concepts from the traditional courses are addressed but in a practical approach with the principles of UDL incorporated. This is not a typical dumping ground situation that many of us have encountered. These are courses for students who need support in being independent and who will not benefit from being exposed to simplifying (5x + 2y – 3xy) – (7x – 8y + 9xy). Here is a link to some documents, including the units and topics. Contact me if you would like more info! I am following the blog Adventures at the Pond (author has some great stuff!) and the following photo was posted on this blog. This is an excellent alternate representation of a concept. I do not know how the author would present this in class but here’s what I would do. I would give the students the number line with the initial information and ask them to estimate the total minutes – no calculation. I would then explain the factor in the percent part (multiply by 5 to get to 100%) and lead the students to carry this factor over into the minutes: This would lead into proportions nicely. I would present the number lines and have the students work out problems using this approach first (Universal Design for Learning) then redo the problems using proportions.